Bayern Munich won their fifth consecutive Bundesliga title in 2016/17 and their 26th overall. 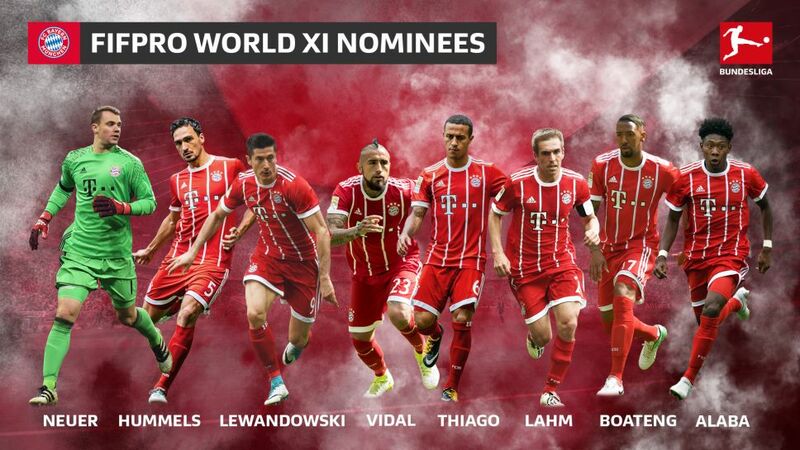 No fewer than eight Bayern Munich players have been nominated for a place in the revamped FIFA FIFPro World 11, which will be announced in London on 23 October. Manuel Neuer, Philipp Lahm, Jerome Boateng, Mats Hummels, David Alaba, Arturo Vidal, Thiago and Robert Lewandowski have all been shortlisted for the star-studded line-up, which is chosen by professional footballers from all over the world. Lahm retired as Bayern's most successful captain at the end of last season with 21 trophies in his glittering career, while Lewandowski hit 30 Bundesliga goals for the second season running as the record champions claimed their fifth straight title. Some 60,000 players in 76 countries will cast their votes for the World 11, which consists of one goalkeeper, four defenders, three midfielders and three forwards. For the first time, in this 13th edition, the award covers the 2016/17 season from August to July, rather than the calendar year. "We're pleased to cooperate with FIFA once again to deliver the world's most prestigious team award," enthused FIFPro General Secretary Theo van Seggelen. "The players decide, and that is the key, as they bring unique insight, knowing first-hand what it takes to reach the top." The FIFA FIFPro World 11 will be revealed on 23 October at the Best FIFA Football Awards ceremony in London.